Edingthorpe is a small, rural village near Walsham, in north Norfolk, set in lovely countryside. There are few village amenities; no pub or village shop for example, but it is that very unspoilt charm that helps make Edingthorpe so appealing. Its the type of place where it feels like nothing has disturbed the peace for centuries. Edingthorpe's parish church is a gem; a round-towered Saxon church with a medieval wall painting and a 12th-century door. All Saints is one of 124 round tower churches in Norfolk, but one unusual feature sets it apart; it has an unusual octagonal top. The church stands almost hidden by trees on the northern edge of the village. The base of the tower may be Saxon. 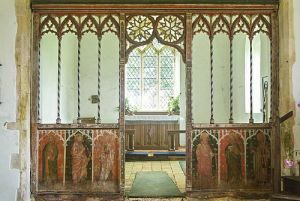 The church retains its 14th-century rood screen and wall paintings thought to be among the oldest in Norfolk. A large painting of St Christopher carrying the Christ child was discovered hidden under plaster during repair work in 1937. War poet Siegfried Sassoon spent several summer holidays in Edingthorpe in his childhood, staying at the Old Rectory. 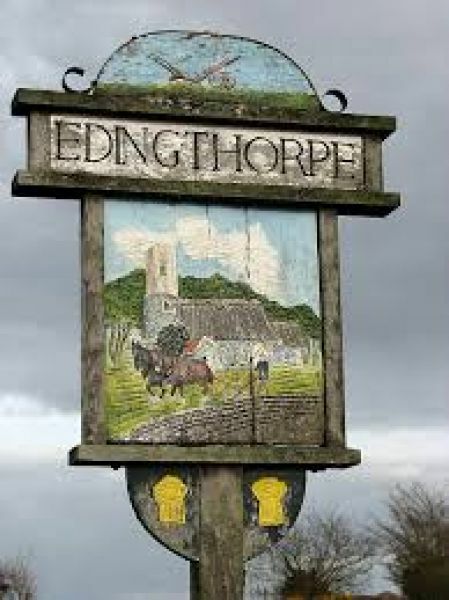 When he revisited the village as an adult he was moved to write, 'Edingthorpe, thank goodness is still a straggling hamlet'. Of All Saints church he wrote, 'a very special dignity and simplicity'. He was less impressed with the village pond, however, calling it, 'an unprepossessing, unfishable pond'. The pond and the rectory are still there, as is the lychgate by the churchyard entrance where Sassoon paused to pick a poppy and a cornflower and leave them under the gate.